I left the house this morning shortly after 8, to take Logan into town for his contrabass festival. I passed Bob on his way out to Turtle Bay and McStalker on his way out to Kahana - which was already looking sunny and nice, a rare treat this early in the morning. Jeff fired up the website chatterbox on his phone to post the day's first report from the beach. JeffMc_Mobile: Beautiful day at Kahana. Come on out. Jeff hiked up to see if it wasn't too strong, and Jim arrived a bit later to join him. Jeff kindly posted some details in his next chatterbox report. JeffMc_Mobile: From KNA - Similar to yesterday maybe 2mph more. A little East, but not too bad. Low launch lighter than expected, but strong at mid launch. I dropped Logan off at Kam School, shopped for groceries in Kaneohe, and headed home. As I passed Kahana again, I could see Jeff in the air above low launch and I heard him on the radio saying he was parked there. I checked the sensor and it was reading an average of 16 mph. Wow! My typical limit for enjoyably flyable conditions is a sensor reading of 14 mph. Jim was on launch waiting for a lot less wind. He swapped wings with Czech Pete the other day and was looking forward to trying Pete's Golden II today. Alex@iphone: 16 mph act at kahana right now - jeff is parked over low launch and jim is on launch hoping it backs off. I went home, unloaded the groceries with Dorothy, took Amelia to her grandparents in Punaluu, and then headed out to Kahana to join Jim in hoping for less wind. JeffMc_Mobile: i just top landed. still a little gusty and east. but do-able, if you want it. Jim had already launched by the time I finally got out there, around noon - and Jeff relaunched as I was hiking up. Don called as I was hiking and I told him it was strong but flyable - a very unconvincing sales pitch. I launched in what felt like light wind at low launch, but the moment I was airborne I shot straight up in strong lift to join the Earls. Bob called me soon afterwards for a radar report, but the best I could do from my aerial vantage point was a visual assesment - from my view of the clear horizon I guessed he'd be seeing very few clouds at Turtle Bay. The three of us flew around in breezy east conditions for a couple of hours, enjoying the abundant lift and skimming the bottom of the occasional low puffy cloud over the bay, until we were ready to land for some refreshments. And it was good! As we folded up our wings under the trees, we met Dave, a prospective pilot who has seen us flying many times - he manages the maintenance of all the lighthouses in the state for the coast guard. A very cool guy. Maybe it was the beverages, but for some reason we ended up regaling him with our worst horror stories - hopefully we also gave him some hint of the incomparable rewards of flying that we've all experienced. Czech Pete called to say he and Jorge were coming, and Suicide Pete decided to join them as well. I had to leave to pick up Logan before they showed up, but by the time I swung back by Kahana at 5, Suicide Pete and Jorge were just landing, reporting conditions just as strong as what we'd found earlier. Czech Pete, flying Jim's Lambada, had surprised the other two by shooting around the corner and blazing downwind to land at Hauula 7-11, just in time for me to retrieve him. I guess Jim's new wing can't be restrained from flying cross country even on a strong day like this. It's an XC machine! It was a breezy and beautiful day out there. Thanks to Jeff for the blow-by-blow chatterbox reports. We're forecast to get even stronger stuff for at least the next few days - maybe that'll give us all time to get those taxes done! Thanks for the report Alex. Ray and I were hoping to get the owner of the company we're working for into the air. Ray took the lighting director up for a tandem a couple of days ago and now the whole company is buzzing about the fun he had. I guess the owner will just have to wait until the next junket job. At 70 years old it's probably a good idea to wait for lighter conditions. Alex - as always appreciate your prolific writing talents. Had a great time flying CZ Peter's Golden II, really a nice lightweight wing. I'm a little surprised we didn't have more company, but you're right - we didn't do a good job of selling it.... "jeff is parked", "gusty and east", "do-able". I just try not to misrepresent those strong or easterly days. But if you're willing, there's still plenty of fun to be had. CZ Peter is the man! The view down range was tempting, but my experience earlier in the stronger conditions, and the prediction of increasing winds in the afternoon, kept me wary. Nice photo! It really captures what I see in a paragliding flight, especially in these days of non-proficiency due to lack flying on my part. The image is a bit foreboding, but beautiful. Did you tweak the brightness, contrast, etc on the photo? Thanks Nick! I uploaded the original so you can see the difference - it's definitely not as foreboding - and even on this "original" I have given it a very slight increase in blacks and reduction in exposure. I just can't help it. It's incredible what you can do with post-processing on a RAW photo from a DLSR type of camera. The challenge for me is not to go overboard all the time. 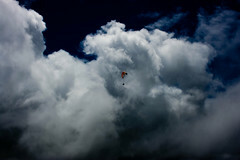 Only sometimes, like on this cloud photo!